About a year ago or so, we published a massive article covering the many, many Asterix games. This time around is a similarly themed article covering the entirety of the Teenage Mutant Ninja Turtles franchise. There are roughly 30 games in total, spanning from the original Konami NES game all the way up until the recent Ubisoft titles, with numerous highs and lows throughout. It's thirteen pages long and includes a brief history of the TMNT franchise itself, making for very comprehensive reading. Since that particular update is huge, there are only a few smaller articles to post up. One is one which I couldn't think of a proper name for, so I called it Vic Tokai - Speed Tengoku Jump Jigoku. It's a series of four (technically, three and a half) platformers developed by Vic Tokai which are all technically part of the same series, seeing how they have largely identical play mechanics, despite there being no thematic links between them. The first is Kid Kool, which I think the Angry Video Game Nerd (righfully) tore apart earlier this year. However, most of the major issues in that game got fixed for the Master System title Psycho Fox, which then evolved into the Mega Drive/Genesis games Magical Hat no Turbo Buttobi Daibouken (in Japan) and Decap Attack (in North America and Europe). It's sort of cool to see ideas go from total unworkable garbage into a minor classic. We're finishing up the single game coverage with Martial Masters, an incredibly nice looking arcade 2D fighter made by IGS, who I keep wanting to call the "SNK of China" just based on its adherence to classic spritework and traditional genres around the turn of the century despite both the hardware and the audience evolving in different directions. 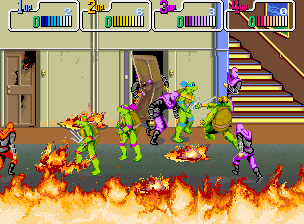 None of their games seem to have ever been ported, so they mostly live on through MAME. Their work is generally worth checking out, including this one. Also up is a new podcast called Game Club 199X, started by members of the HG101 forums and IRC channel. The idea behind this series is to play games as they were originally intended - that is, no FAQs, no cheats, no save states, just the support of the local community - to get through some rather old and obtuse games. Last month's game was Snake's Revenge, which is discussed in this episode. December's game is the Interplat classic (and predecessor to Fallout) Wasteland, so check out the forum thread if you're interested in joining in. And Your Weekly Kusoge is the Amiga version of Akira, which is largely regarded as the second worst game on the computer. So very much lost potential, there. wow, the TMNT article might just be my new favorite on the site! Odd timing on that Game Club 199X podcast, since I had considered pitching the idea of doing an article on here for Snake's Revenge. IGS is awesome, if for no other reason than their frequent references to Hong Kong cinema. Scorpion, from Martial Masters, is pretty much a direct lift of Kim Won Jin's villainous character from Operation Scorpio. Fights the same way and everything. Master Huang is obviously Huang Fei-Hung, doing moves straight out of Tsui Hark's Once Upon a Time in China -- granted, their Huang is a good deal beefier than Jet Li or Kwan Tak Hing. Their older fighting game, The Killing Blade, has characters who look or dress like characters from old Shaw Bros. films like The One Armed Swordsman. IGS is (was?) based in Taiwan, and so it's nice to see a Chinese developer give their own take on their culture, rather than seeing it filtered through the Japanese. Their Three Kingdoms and Journey to the West themed brawlers would make for good articles, if you can find somebody to write them.